Nanciann Horvath was born in Bethlehem, PA, to a theatrical Hungarian/Slovak family. She decided at age five to be a nurse, when she saw those great, white, crisp uniforms! 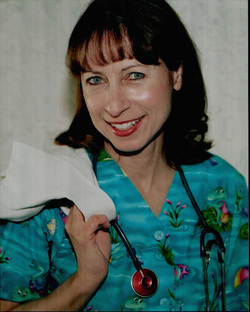 After graduating Sacred Heart Hospital School of Practical Nursing, she moved to Morristown, NJ, where she did both nursing and local theater. She also started taking classes in New York City for acting, commercials and improvisation. She moved to New York City, worked for an oncologist, studied at the HB Studios and also worked at Radio City Music Hall. Moving to Los Angeles, CA, proved to be a good decision because having joined the American Federation of Radio and Television Artists (AFTRA) her Screen Actors Guild (SAG) card came a year later. Nanciann has always seen the need to live in the present moment. Nursing has shown her we are all here to make a difference and each day is truly a gift. Having done improvisation with the LA Connection Comedy Theater and other LA groups she started reading and doing research about the health benefits of improv. Her business has been building for years with health groups, businesses, church groups, schools, senior centers and anyone interested in obtaining better total health. Nanciann can accommodate large or small groups; can set up an ongoing series or a one-time seminar, and can mix improv with Christian spirituality for church groups. Improvisation teaches us to be flexible, live in the moment and think outside the box. Take that step and get started today!